When rock climbers die, they can only hope that they end up in a place as perfect as Yosemite Valley. The weather is great, cracks flawless and beauty unsurpassed. 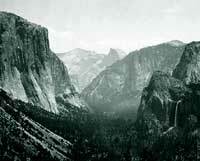 As a general rule of thumb, Yosemite climbs tend to be steep, smooth, and sustained. Below you will find our list of the 100 finest single and multi-pitch climbs in Yosemite Valley. Use the below chart to see which routes are available on the SuperTopo web site or use this chart to compose your dream tick-list of Yosemite classics.